"I'm going to drop a lot of f%#$ing F-bombs, and if you don't f*#$ing like it, you can f@%!ing leave." Thus began an official session at South by Southwest Interactive (SXSWi). My reaction to this speaker matched my feelings about the entire SXSWi 2012 experience: It's time to grow up. SXSWi turned 18 this year. SXSW originated as a music festival in 1987 and added SXSW Multimedia to mix in 1994. Although SXSWi now is legally an adult, you would be hard pressed to tell that strolling through hotel lobbies, 6th Street or the Austin Convention Center last week. SXSWi seemed less a conference for interactive and social media professionals than spring break for folks trying very hard to appear the exact opposite of what they really are--executives who work and consult with Fortune 500 companies. I had to remind myself that the guy in line next to me sporting a three-day growth of facial hair, knit cap, indie band T-shirt and overstuffed backpack wasn't a student but a professional who charges $500 an hour to tell CMOs how to build social engagement. I think it's time SXSWi acts its age. Interactive and social media have moved to the center of corporate strategies, and professionals in this space no longer are lone evangelists fighting against marginalization within corporate structure. Ad spending in social media is up, the size of the social business industry exceeds $100 billion and social media budgets at more advanced enterprises are into the seven figures. As Altimeter's Jeremiah Owyang points out, social media folks are now earning the title of vice president when "two years ago, the average title was manager and director" (or guru and ninja). We've arrived, but at SXSWi, we don't want to act like it. People are far more likely to tell you about the hot party they attended rather than the hot panel they observed. There was considerably more buzz about Jay-Z's performance than keynotes by Amber Case and Ray Kurzweil. Attendees couldn't wait to show off the great schwag they got, not the great insights they heard. And I was actually embarrassed watching interactive professionals dashing after branded T-shirts tossed from passing buses. My peer, Josh Salmons, hit the nail on the head when he observed, "SXSW is like Mardi Gras for nerds." Other digital and social conferences are not like this. I have attended great events in the last two years such as the ANA Digital and Social Conference and the Social Media Insiders Summit. People at these conferences have fun, dress down and spend their nights partying, but education, insights and business come first. Maybe Austin brings out the "weird" in people, or maybe business execs feel pressured to fit in next to the rockers, folkies, actors and filmmakers in town for the other portions of SXSW. Am I a grumpy old man? Perhaps, but I have worked for 15 long years building credibility for digital and social strategies in a world that often viewed them as fluffy and inconsequential distractions, removed from essential business processes. I think it is time for SXSWi to reflect the maturity, professionalism and impact of today's business-driving social and digital strategies. Do you agree or disagree? To paraphrase the foulmouthed SXSWi speaker, "if you don't f*#$ing like it, you can f@%!ing leave..." a comment below. At last week’s Facebook Marketing Conference (fMC), the company announced new timeline features and ad programs, which are thoroughly explored in great summaries by TechCrunch and Attention. Marketers are atwitter (pun intended) over new opportunities for social media at scale, but the announcements made me wonder if Facebook was diminishing the power of earned media and elevating old-fashioned paid media. Which brand do you believe deserves to win in the social era: The one that earns the most attention through its products, services and brand, or the one with the biggest advertising budget? "Thus far, brands have invested in fans. And brands have invested in content to engage them. Now, by investing in Reach Generator and Premium on Facebook, brands have the ability to guarantee that fans see this content. While brands are paying for distribution, brands are receiving significantly more engagement. This will greatly increase a Page’s EdgeRank score, which will, in turn, grant a greater ROI as more of a brand Page’s content will be viewed over time." "While you're paying for distribution, you're getting significantly more engagement. This engagement is 'Facebook gold,' as I like to say. Your EdgeRank score will be juiced." Wait a sec--brands that invested in fans and content now must invest in paid media? 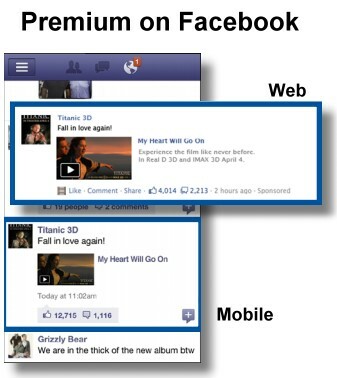 And paying for distribution will increase a brand's content's EdgeRank, Facebook's method for (authentically?) recognizing the content that fans most want to see in their newsfeeds? It sounds as if earned media has just taken a knee to the groin from old-fashioned Advertising 1.0. I have mixed feelings. On the one hand, I think Facebook has finally given to marketers the tools they need to drive success on the Facebook platform--the combination of Open Graph, new action types, richer fan pages, Reach Generator and Premium for Facebook furnishes a powerful (if still complex) marketing suite. On the other hand, I also cannot help but think back to the tenants of social media as expressed in the Cluetrain Manifesto: "We are immune to advertising. Just forget it..." Not so quick there, Cluetrain! There's a new sheriff in town--and he looks a lot like the old sheriff in a new uniform. Different observers have different opinions what this all means, but I believe one thing is certain--Facebook users will see less organic brand content in their newsfeed and be exposed to more paid brand content. No, that is not exactly what Facebook execs said on stage at fMC; instead, they launched Reach Generator which, according to Ad Age, "lets you pay money to guarantee that your Posts get to at least 75% of your fans each month" instead of the 16% Facebook says sees wall posts currently. Facebook is also launching Premium on Facebook, which allows brands to insert their posts into fans' newsfeeds (both in the browser and mobile versions), saving brands the hard work of earning their way into fans' attention. Facebook guaranteeing impressions can only mean one of two things. The first is suggested by The New York Times, which says we will see a great deal more ads: "Facebook’s hundreds of millions of users could soon be faced with a lot more advertising — in their newsfeed, on their mobile devices and even when they log off." I'm betting on option number two, which is the less dangerous one for Facebook: The number of brand impressions will stay more or less steady, but paid impressions will push earned media out of the way. Maybe this isn't an either-or situation but instead marks a new synergy between paid and earned media; after all, these new Facebook ads all begin their lives as posts, not traditionally-designed ads. Or maybe Facebook just eviscerated the difference between earned, owned and paid media (for better or worse). Michael Lazerow thinks so: "The lines between what marketers now refer to as paid, owned and earned media are now officially gone. Goodbye. Gone." Still, if the way a brand gets noticed in social media increasingly depends on its checkbook, this seems to mark a new phase in the evolution of social media. Are we seeing the passing of the era of earned media so soon? Is Facebook now like television, putting challenger brands and small brands with limited budgets at a disadvantage against the brands that can invest liberally to get their messages distributed? And can we say that earned media is, in fact, earned if most people see it only because it is paid? Funny, but I remember the shop owner earning the relationship with me, not buying it.